Designed for use up to 700 bar with hydraulic jacks, cylinders, etc. They are the threaded union type for interchanging cylinders in seconds. Each half is valved with a precision ball for a tight shutoff when disconnected. These couplers also permit the separation of cylinders or hose from pump when at 0 bar with minimal oil loss. At SGS we have an amazing range of hydraulic couplers for sale. Our selection includes hydraulic adapters, quick release couplings and other quality hydraulic couplings perfect for use with hydraulic jacks and cylinders. Our selections of hydraulic couplings are designed for use up to 700 bar with all different types of hydraulic components. The quick release couplings we supply are the threaded union type for interchanging cylinders in seconds. Each half is valved with a precision ball for a tight shutoff when disconnected. The hydraulic couplers also permit the separation of cylinders or hose coupling from pump when at 0 bar with minimal oil loss. Take a look below to see our comprehensive stock which covers a variety of hydraulic adapters such as hydraulic hose couplings and other great hydraulic pump couplers. No. 9798 - Male (hose) half coupler (less hose half dust cap), 3/8" NPTF. No. 9796 - Female (cylinder) half coupler with No. 9800 dust cap, 3/8" NPTF. No. 9796-V - Same as 9796, but with Viton seals. No. 9796-E - Same as 9796, but with EPR seals. No. 9799 - Optional metal dust cap (hose half). No. 9797 - Optional metal dust cap (cylinder half). High flow, no-spill, push-to-connect couplers with locking collar and flush face designed for high pressure applications. The flush-face concept of these hydraulic hose couplings makes it easy to clean both coupler ends before connecting. 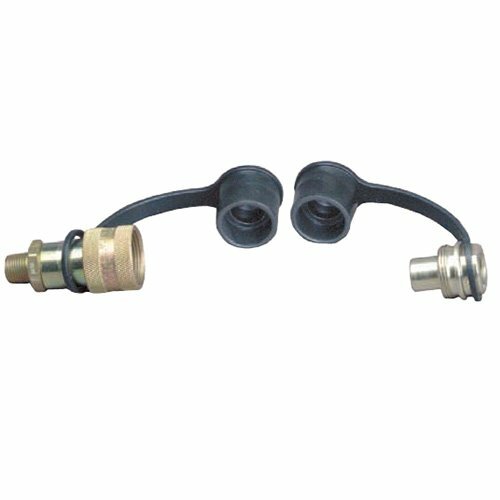 Our unique push-to-connect, "dry-break" design eliminates oil spillage and allows for quick release coupling. The locking collar makes accidental disconnects a thing of the past. For 10,000 psi operation. Designed to permit high oil flow. No. 9792 - Female (cylinder) half quick coupler only. No. 9793 - Male (hose) half quick coupler only. No. 9794 - Complete quick coupler (male and female). Dust caps not included. This hydraulic coupler dust cap fits either male or female half couplers. No. 9800 - Dust cap. For male or female 3/8" NPTF half couplers. As you might have guessed from the above, when it comes to quick release coupling, hose coupling and hydraulic adapters, we have everything you need at SGS. So when you find what you’re looking for place your order today. Don’t hesitate to contact our team though if you have any questions. We can help you out on everything from which hydraulic hose couplings or which hydraulic pump coupler are the right for you.